Outside my window…it’s grey and cool. The city garbage trucks are unexpectedly cruising the streets, picking up bagged leaves for composting. We’ve got to do a final rake and mow this week before the snow falls. I am thinking…about how much I miss my brother and his family. They spent their first night in their new home last night, after five nights bunking in here. The house seems eerily quiet. I am thankful for…Michael’s return from a weekend with his brother at Queen’s. It sounds like he had a good time. He’s 14, and traveled on his own by bus for 3 hours, and then grabbed a cab to get to Alex’s. On his way home, he got from the bus station to the subway and traveled north where Z picked him up. I’m very proud of his independence and maturity. I am learning…that the best way to get iron-rich blood is via chopped liver on a poppy seed bagel from our local 24-hour Bagel House (“authentic Montreal wood oven bagels”). Their chopped liver has caramelized onions mixed in which makes it quite sweet. From the kitchen…I made some yummy banana/blueberry muffins this weekend. I hadn’t made muffins for months, and they’re a great quick snack to have around. I’ll look for some higher fibre ones and continue to add frozen wild blueberries. I am wearing…sleepwear and slippers. My hair is brushed though. I am creating… a colour scheme for my kitchen and dining room. I am going…to enjoy seeing Z grow out his beard for a week. He’s away at a team strategic planning session for five days and I won’t see him ’til Friday. I haven’t seen him with any facial hair for years….he has a heavy beard, but it’s coming in grey these days so it’ll be interesting. I got a grizzly goodbye kiss this morning that I quite liked! I am reading…Rapt: Attention and the Focused Life – a terrific book. I blogged a little about it earlier today. Next up is The Group by Mary McCarthy. I am hoping…to get a lot accomplished the next three weeks while my sweetie is away Monday to Friday each week. I don’t know why, but I always feel more productive when I have long stretches of time on my own. Not that I like it when he’s away, but …. it’s different. I am hearing…Michael rustling around in the kitchen, making his lunch. Around the house…we’ll be getting our crown moulding and light fixture up in our dining room this week. Plus paint. We’ll get the kitchen painted at the same time, but I’ve got to pull down some ugly border wallpaper first. One of my favorite things…is The Pioneer Woman Cooks ! I had pre-ordered my copy and it arrived this week! It’s full of her beautiful photography and step-by-step illustrations for her fabulous recipes. This will be my g0-t0 book for lots of meals! No more printing (and losing) recipes from her website. It’s a truly gorgeous book. A few plans for the rest of the week: my theology class this morning, babysitting my niblings* this afternoon, my son’s 18th birthday on Thursday, my husband’s 50-something-th birthday ALSO on Thursday. Z is out of town ’til Friday at a conference north of the city, so it’ll just be Michael and I at home all week. 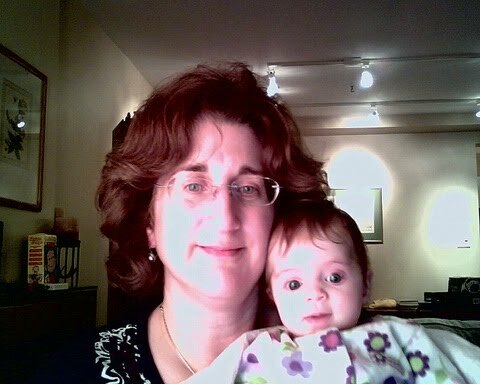 Here is picture for thought I am sharing… This is lousy quality…it was taken with my webcam while my 11 week-old niece Emily and I were surfing the ‘net. To see other daybooks, please visit our hostess! * my Aunt Edith coined the term “niblings” to mean nieces and nephews. I get so much accomplished when my hubby is gone, too. I guess I am less concerned with “entertaining” or spending time together. I am impressed at the independence of you 14 year old. That is impressive. My oldest is twelve but I can't even imagine him doing something like that, wow! Hope you have a lovely and productive week! Awe, what a sweet baby! She look so old for 11 weeks. And I to am impressed with the independence of your 14 year old. WOW! That's really neat. I haven't had chopped liver in years. I know it has to be cooked just right to have the best texture and flavor though. Sweet picture too. Thanks for sharing your daybook with us! I enjoyed it greatly…ahh, the hubbs working away! We are on about month 6 of my hubby doing the m-th thing and then a 3 day weekend. I agree about getting more done, but I need to so I can enjoy my time with him more and not be running around the whole time he is home 😉 AMAZED by your 14 year old's independance…WOW! Baby is sweet, loved the pic! Hope you have a blessed week. Chopped liver? No thank you! I'm getting my copy of PW Cooks tomorrow for my brithday. I told my husband to get it for me. 🙂 Can't wait!